Guitarist’s celebration of the blues, enlisting his longtime band, features favorite songs by blues masters. Street date is May 17. AUSTIN, Texas — When it comes to the blues today, there are a handful of guiding lights to make sure the music stays true to its powerful source. The sound of pleasure and pain that first sparked musicians to create such a sound is a force that can never be underestimated. The mojo has to be there. 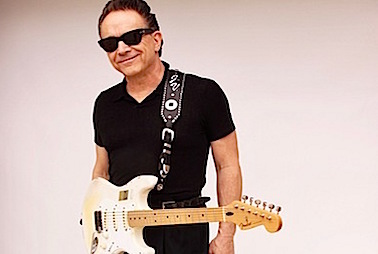 Texas guitarist/singer Jimmie Vaughan has dedicated his life to making sure the blues not only stays alive, but remains full of life and an inspiration to all who listen. He’s held onto the spirit of the blues for more than 50 years, and he isn’t about to stop now. Vaughan's new album, Baby, Please Come Home — due out May 17, 2019 on the Last Music Co. — is a rolling and righteous celebration of everything the blues can be. The songs can go up, down, sideways and even off in their own distinctive direction, but one thing is certain, each and every one of them is packed with pure feeling and striking originality. That's because while the blues is almost as old as America itself, every time a musician lends their soul to living inside these songs, something new comes out. There is a constant reinvention for musicians like Vaughan, because the blues demands it. There can be nothing less than a revelation, because that’s how the music thrives. It is almost like an alchemy exists, where instruments and voice join together to make a joyful noise. And above all else the blues, in the capable of hands of Vaughan and his musical cohorts, is a path to salvation. One that is birthed in the ability of songs to make life on Earth a better place to be. Sometimes it takes decades to finally arrive at a place called home. When a young player starts out as a teenager to find a spot to call his own, there can be enough twists and turns to throw even the most dedicated of souls off the mark. Life can be a tricky endeavor, and between the bright lights and the dark nights, that road ahead can be full of false starts and deceiving roadblocks. 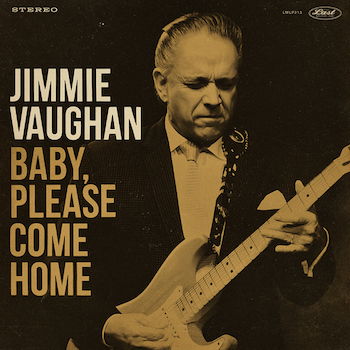 But on Baby, Please Come Home, Jimmie Vaughan proves without doubt all his efforts and energy have taken him to the promised land. Maybe that’s because blues is really the art of distillation, seeking the sound where there are no extraneous notes, or unnecessary additions to the feeling of freedom. It takes years to get there, and patience is most definitely a virtue. Above all else, feeling is the most important element of all. With that, all else can be conquered. “Playing what you feel has always been my main goal,” Vaughan says. Considering he’s had the kind of career that makes him a living legacy, those are no idle words. His first group — when he was starting high school — played Dallas’ Hob Knob Lounge six nights a week, learning the kind of lessons that can't be taught. They have to be lived. Other bands in the ’60s convinced the young man it was time to find a way to play the music he felt the strongest about: the blues. That took him in the early ’70s to Austin, where he carved out a new crew of blues players who shared his musical excitement. Jimmie Vaughan started in the lead, and has remained there. For the past few years, in studios near Austin, Vaughan has been recording a series of albums dedicated to the songs he's always held in high esteem, recorded by artists who’ve inspired him since his earliest days of performing. His fellow performers on these dates understand that music is intended to ignite the heart and fill the soul. There can be no shortcuts or sleight-of-hand when playing these songs, which come from folks responsible for so much popular music; some who are famous and some who are not known outside the blues or country worlds. On Baby, Please Come Home, those original artists include Lloyd Price, Jimmy Donley, Lefty Frizzell, Richard Berry, Chuck Willis, Bill Doggett, T-Bone Walker, Etta James, Fats Domino, Gatemouth Brown, and Jimmy Reed. In so many ways, this is a list of some of the prime purveyors of America’s greatest sounds. That it can range from seminal bluesmen like Reed to one of the founding fathers of modern country music, Frizzell, proves the point that Vaughan has always believed: music is not about what it is labeled, but rather how it makes the listener feel.